Latest U.N. Sanctions Are An Act Of War, North Korea Says : The Two-Way Pyongyang said it's a dream for the U.S. to think it will give up its nuclear weapons. The U.N. Security Council last week approved new sanctions against North Korea after its latest missile launch. U.S. 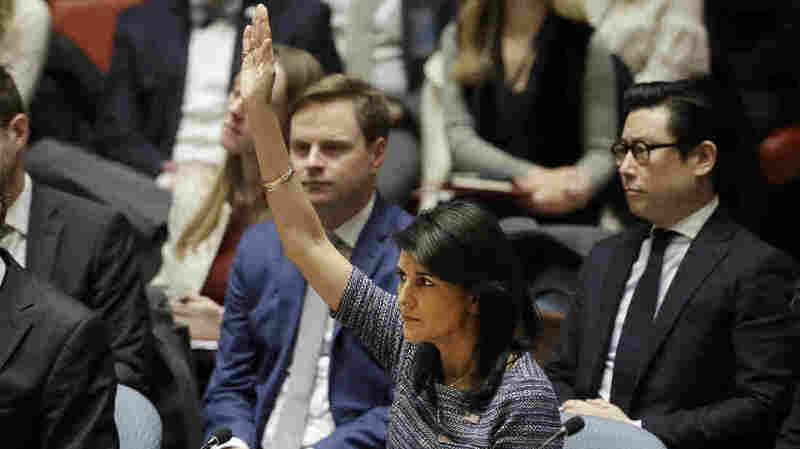 Ambassador Nikki Haley on Friday votes in favor of a U.N. Security Council resolution calling for new sanctions against North Korea, including sharply lower limits on its refined oil imports, the return home of all North Koreans working overseas within 12 months and a crackdown on the country's shipping. North Korea on Sunday called the latest U.N. sanctions against the country "an act of war" that violates its sovereignty. The U.N. Security Council unanimously decided to adopt a resolution tightening sanctions — further cutting oil supplies and cracking down on what the U.S. sees as a North Korean slave labor market. The resolution issued last week was a rebuke to North Korea that prompted Pyongyang to declare that it would further upgrade its nuclear force. The resolution, passed on Friday, was drafted by the United States and negotiated with the North's closest ally, China. "It sends the unambiguous message to Pyongyang that further defiance will invite further punishment and isolation," Ambassador Nikki Haley said after the vote. "We define this 'sanctions resolution' rigged up by the U.S. and its followers as a grave infringement upon the sovereignty of our Republic, as an act of war violating peace and stability in the Korean peninsula and the region and categorically reject the 'resolution.' North Korea 's foreign ministry also said in a statement that the sanctions are tantamount to a "complete economic blockade" of North Korea." While Russia voted for the resolution, its ambassador complained about the U.S. focus on sanctions rather than talks. China's ambassador warned against "tough posturing and confrontation." He said no one wants this to spiral out of control, and he's urging the U.S. to scale back military exercises to pave the way for talks. Diplomats at the U.N. were also stressing the need for negotiations. French Ambassador Francois Delattre says a tough international message should be part of a diplomatic strategy. "Maximum firmness today is our best antidote to the risk of war." U.S. Secretary of State Rex Tillerson says the door remains open for talks.